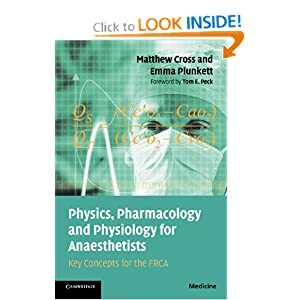 The FRCA examination relies in part on a sound understanding of the basic sciences (physics, physiology, pharmacology and statistics) behind anaesthetic practice. It is important to be able to describe these principles clearly, particularly in the viva section of the examination. This book provides the reader with all the important graphs, definitions and equations which may be covered in the examination, together with clear and concise explanations of how to present them to the examiner and why they are important. Particular attention is paid to teaching the reader how to draw the graphs. This is an aspect of the examination which can be overlooked but which, if done well, can create a much better impression in the viva situation. Packed full of precise, clear diagrams with well structured explanations, and with all key definitions, derivations and statistics, this is an essential study aid for all FRCA examination candidates.